Exposed Outdoor Sculpture Exhibit, Helen Day Art Center, Stowe, Vermont. The photo shows the topmost branches of a giant elm, dead from disease, which once shaded the cows in the pasture by my house. The viewer is standing on a footbridge over the river looking down at the tree, now sliced and chained together as an articulated skeleton. The river currents cause the tree to undulate, as the air once did. 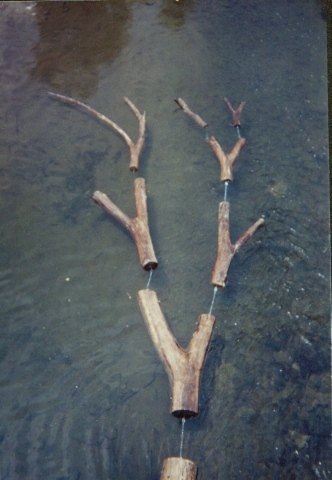 The tree branches also prove a perfect analogue for the branching river. This was an extremely popular work. People actually stood on the bridge and discussed it. Some threw pennies so by the season's end, it was studded in copper.